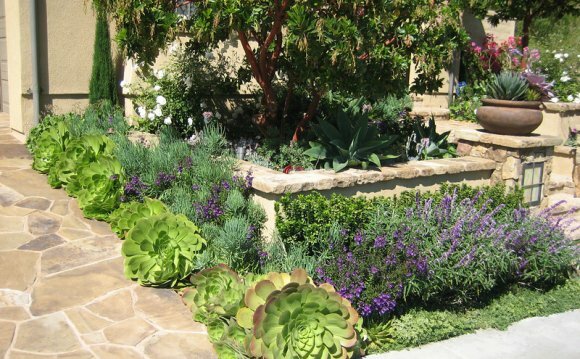 If you're interested in creating a Mediterranean-inspired garden, here are some traditional plants to choose from, as well as some other waterwise plants that harmonize well with this style. Lavender, wormwood (Artemisia), sage, lavender cotton (Santolina), rosemary, oregano, and thyme all make excellent additions to a Tuscan-style garden. Because their foliage releases scent when they are brushed against, they can make an excellent planting for along a pathway or near a seating area. The grayish-green foliage of many of these herbs harmonizes well with olive trees, and the cool purple-blue tones of many of the flowers contrasts nicely with the warm hues used in so many Tuscan garden designs. When using Mediterranean herbs, don't be afraid to go bold or formal in your design. It takes courage to plant 50 lavender plants along a pathway, but the effect will be well worth it. Likewise, formally flanking an entry with matching rosemary plants takes a bit of forethought, but strong design statements like these make the rest of your garden seem like part of a larger theme. The tall spires of Italian cypress provide a sense of order and formality to a tumbling, exuberant garden. Dwarf varieties such as 'Tiny Towers' can be placed in pots to highlight a patio or entry, or they can line a pathway and lead your eye toward the next view. Large varieties of Italian cypress can make excellent screens toward the periphery of the landscape. However, the drawback to using Italian cypress is they are suited only to climates with summer heat (and realtively low humidity). In my cool, rainy climate, they last just a few years before turning brown and sad.